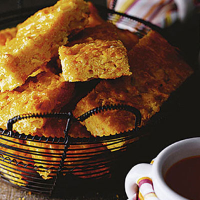 A great recipe for Halloween, corn bread can be served with warming soups, stews and chillies. Preheat the oven to 180°C, gas mark 4. Lightly oil a rectangular 18cm x 28cm rectangular roasting tin. Sieve all the dry ingredients together into a large bowl and stir in a pinch of salt and the chilli flakes, if using. In a separate bowl, beat the oil and eggs together. Pour into the dry ingredients and stir until smooth. Add the grated pumpkin and sweetcorn, and mix until thoroughly combined. Spoon the mixture into the prepared tin, level the top, and cook for about 25 minutes, until risen and golden. Remove from the tin and leave to cool for 5 minutes. Cut into slices and serve warm or cold with soup, such as Waitrose Fresh Cream of Tomato. Alternatively, try with stews or chilli con carne. Corn bread freezes beautifully. Separate the slices with greaseproof paper before freezing, so pieces may be defrosted individually, as required. They can be kept frozen for three months. A spicy red from the South of France is a wise choice if you do add chilli to the bread. This recipe was first published in October 2006.